More importantly, don’t just develop a discipline around collecting data: make sure you are similarly disciplined about analyzing it. Your goal is to look at what you’ve collected and generate insights. That requires reflection, not just counting. Which vehicles and channels gain us the most traction? Are they generating the types of traction we want? Is the traction leading to mission success? How should we adjust our workload internally to reflect those results? How did this program help us meet our overall strategic goals? How are our efforts supporting our programs? Reflecting does not have to be a private activity. It can be done in connected, transparent ways. The organization’s blog or Web site can be a place to share lessons learned with readers and ask them for their feedback and suggestions as well. The result is a powerful way to learn and improve over time. Make sure that everyone involved in a project also gets involved in the analysis. Remember, every person and department should have access to the data they need in order to create actionable changes. That means making reports meaningful and relevant. Don’t just throw charts up on a wall and expect people to understand them. Make sure that any reporting you do is full of context and relevance. 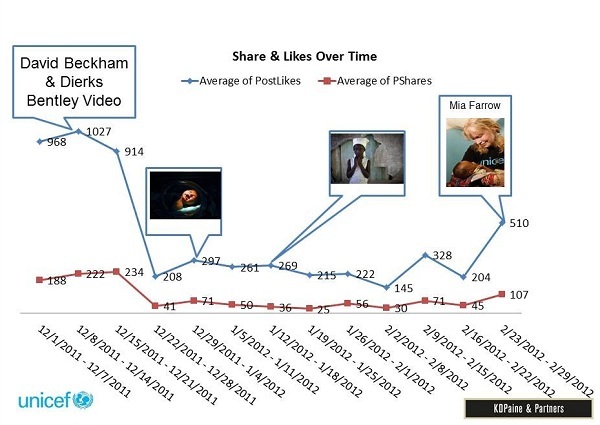 For example, without the pictures, this chart above doesn’t say anything other than “There was a big spike in December.” But what it conveyed was that UNICEF’s Goodwill ambassadors, Mia Farrow and David Beckham, were most effective in generating the kind of engagement UNICEF was looking for. Obviously changing the world doesn’t happen just by accumulating data. Using data to help your organization succeed in its mission involves achieving consensus on what success looks like, getting good data that helps drive decisions making, and, most importantly, it requires good analysis so you understand what is and is not working to achieve your goals. Read this article in its entirety in the September 2012 issue of NTEN:Change. Does your organization have a good process for learning from all the data it collects? Please share your tips and stories below.